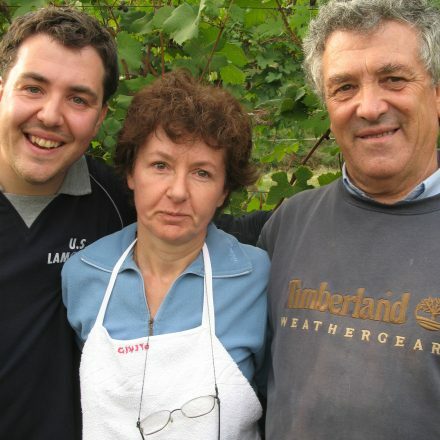 Born only in 2012 the Trediberri cantina of La Morra pulls together three Piedmontesi (Nicola Oberto & his father Federico and their associate Vladimiro Rambaldi) who’ve invested in 5ha of Berri vineyards, a hamlet of La Morra, back in 2008. Nicola is a recent graduate of Milan’s Bocconi University, former Merrill Lynch staff, a statistician and a passionate advocate and lover of fine wine. Father Federico has spent forty years working for a local, large Barolo producer, while Nebbiolo enthusiast Vladimiro runs a bank. There’s an important fourth person, Anna Rosa Oberto (mother/wife) who tends the vines fastidiously when not working at the local post office. In addition to the 5ha, the Oberto family have 2ha of one of the Langhe’s top vineyards: Rocche dell’Annunziata; located in the very heart of the vineyard. Indeed their new winery in the Borgata of Torriglione overlooks the vineyard. Guided by Anna Rosa, they follow a low impact, organic approach to viticulture, while the wines are made traditionally with extended macerations & large oak ageing. Trediberri also rent c. 2ha of nearby Capalot vineyard that offers older vine, ESE facing fruit; blended with their Berri fruit to make their Barolo from 2012 vintage. > Certified organic since 2015. 2017 Langhe Rosato, La Morra – bottled mid-February 2018, tasted just before bottling. A blend of indigenous Langhe varieties: 30% Barbera, 30% Dolcetto, 20% Freisa, and 20% Nebbiolo (the Nebbiolo is again from the Rocche dell’annunziata declassified fruit! )Perfumed, with notes of wild strawberry, raspberry and a hint of rose. Lots of ripe, juicy fruit on the palate, with silky tannins and mouth-watering acidity. Slightly drier than the 2016 vintage, with less than 1g RS. 2017 Barbera d’Alba, La Morra – tasted early Feb 2018 from tank. Fruit from Torriglione, where the soil is mainly clay, and is compact. 30% whole bunch fermentation (in cement). Concentrated dark cherry and bramble. Very juicy and peppery on the palate, with prominent tannins adding structure and body. 2017 Langhe Nebbiolo, La Morra – tasted from tank. Completely de-stemmed. 90% of the fruit is from the Berri vineyards, where the vines are young (planted 2007 on alluvial river soil), and high up, over looking the Tanaro river. The other 10% is from Capalot, where the vines are older (33-35 yrs). Ripe and fragant strawberry fruit aromas, a touch of rose. Pure, juicy, with a wonderful lightness of touch, very fine tannin and concentration. 2014 Barolo, La Morra – Pale ruby. 80% Berri, 20% Capalot. Fermentation in cement, with 19 days on the skins. Ageing for 22 months in botti grandi (used Slavonian oak). 100% La Morra fruit. Capalot is calcareous clay, East facing. Quite cool, old vines (33-35 yrs). Bright red fruit, orange skin, bergamot, with gentle earthiness. Oak lends a subtle framing, lightly spiced, tannins are fine and prominent. Classic, elegant and long, expansive. 2014 Barolo Rocche dell’Annunziata, La Morra – bottled 12 July ’17, 98% botte grande, 2% barriques (! ), so still very young to taste, but already fine, earthy/incense, clear, stable, complex; to taste, taut cassis, wild strawberry, focus, crunchy cool, ribes zip, great complexity, sfumatura, delicate, refined…according to Nicola, La Morra in vintage 2014 received 15% less rain than in 2013! 2013 Barolo Rocche dell’Annunziata, La Morra – the first vintage in which the Oberto family has employed only botte grande! This gem saw 23 mths in new 20HL Garbellotto, having fermented for 27 days in cement. So delicate, refined, a beautiful rose petal scent, detailed, strawberry earth, incense, curry, cardamon, fragrant, sapid, tight cassis, porcelain, ribes, poise, energy, quivering, pedigree, weave, stoffa, red cherry stone…tutto!